Hate checking the weighing scale and finding you have gained yet another pound. It seems that even how much you try–days, weeks, or even months, trying to resist the temptation to indulge on your favorite food! No worries. Why not try shifting to South Beach? South Beach is just but one of the most popular ways to diet. Since the release of the book by Dr. Arthur Agattston on 2003, it has been popular not only in the United States but also internationally. We’re sure you have heard about it and are curious as how it works. To date, many are tuned in with South Beach. It was designed however by Dr, Arthur Agatston, a cardiologist, as a diet for chronically overweight patients. Most of these patients were suffering from heart disease. Fortunately, Dr. Agatston’s patient responded positively to the diet making South Beach tick among the residents of Miami, which in few years time has become a breakthrough in dieting. South Beach diet is all about taking the right amount of fat and carbohydrates by eating the right food. Instead of having low carbohydrate diet, you just take in a certain amount that would not result to gaining weight. By eating the right amount, you become fit and healthier– even loosing 8-13 pounds in a period of 2 weeks. A lot of people mistake South Beach as the same as Atkins. 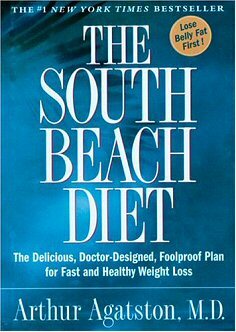 According to Agatston however, South Beach is far different from Atkins since its does not require a low carb diet. Anyone under the South is required to take in just the moderate amount of carbohydrates but not necessarily lowering the intake. The diet is composed of 3 phases. The first two being the most difficult since its the period which the body adjusts to the new eating habits. Phase 1: This phase would require you to eat the following: bread, potatoes, sugar, rice, alcohol, and baked goods. Apart from the above, you don’t have to deprive yourself of eating meat, turkey, chicken, eggs, and fish as much as you are required to eat veggies, nuts, and cheese. Phase 2: After the very strict Phase 1, you get to choose any of your favorite foods in your diet. This is often referred to as the Foods to Avoid. You are probably thinking that it would be insane to add on those few foods. But then again, as explained by Dr. Agatston, once the body has adjusted to rigth amount of fats and carbohydrates eliminating the bad carbs, the body has already adjusted. That is the main principle behind Phase 1. Phase 3: This is the most unrestrictive phase of the Diet primarily because the body has been set. But most importantly, a guideline should be establish for maintenance. By this time, the diet would have become your lifestyle. Unlike any other diets, South Beach becomes effective because it aims to change your eating habits. It conditions the body to take in only the necessary fat and carbohydrates needed by the body. Once this is achieved, there’s a likely difference not only in your wait measurement but your overall fitness.